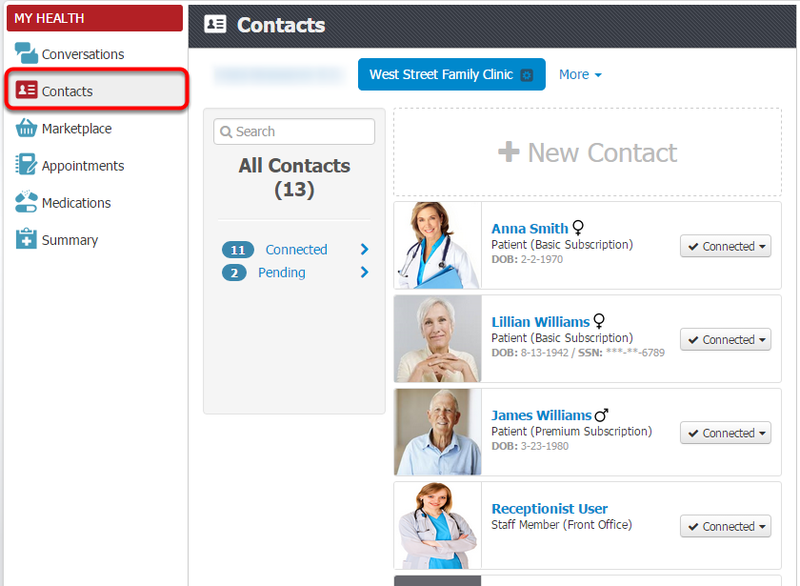 Contacts (formerly called Connections) can be created for each person, organization, or direct address that you wish to communicate with on myHEALTHware. myHEALTHware users can also invite a contact to create their own myHEALTHware account in order to connect with you. All patients who have a chart in your SOAPware database. This includes patients who are connected to the clinic and have a myHEALTHware account, as well as patients who have not yet created a myHEALTHware account. All Direct Addresses that you are attempting to connect with. All organizations that you are attempting to connect with. Why are Some Contacts "Connected"? myHEALTHware now contains both "contacts" and "connected contacts". A "contact" is not necessarily connected to myHEALTHware. Connected contacts can include patients who have created a myHEALTHware account and are connected to your clinic, Direct Addresses who have accepted your connection request, and organizations that you are connected to through myHEALTHware.